The Athenian Trireme (Greek trieres) was the "state of the art" fighting ship designed to be able to cover long distances quickly under oar and sail, and in battle to ram enemy ships with devastating effect. Money from the new vein of silver in Laurion enabled Athens to buy timber from Italy to increase her fleet from 40 in 489 BC to 200 in 480. The polis paid for the ship and its crew equipment and repairs were paid for by a rich citizen as one of the liturgies (trierarchia - a brilliant Athenian notion which shamed the richest citizens into spending their wealth on the city, without the need for taxation). 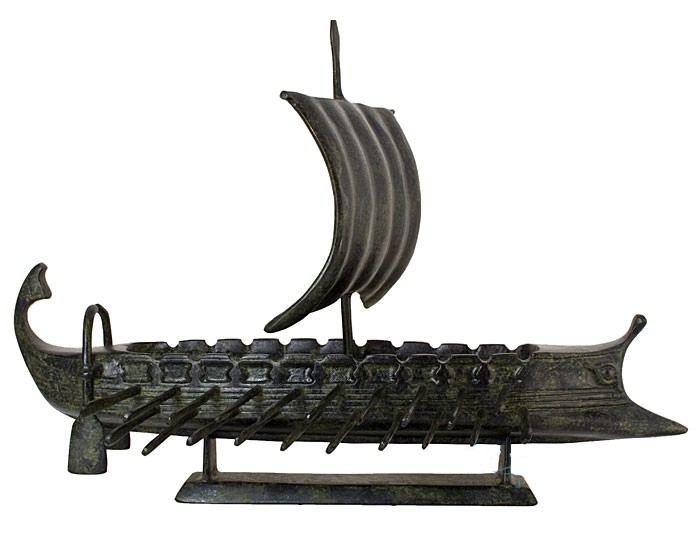 Fine example of the ultimate Athenian fighting ship, made entirely of bronze.